Designed by Ramage Company, this home features Italianate architecture with picturesque detailing and bountiful amenities. The first floor includes generously sized common areas, a bowed window bay and an owner’s suite for convenient one-level living. The paneled study, conveniently located off the foyer, connects to a full bath and easily converts to a second suite if necessary. The second floor features three bedrooms, two full baths and a loft complete with kitchenette. 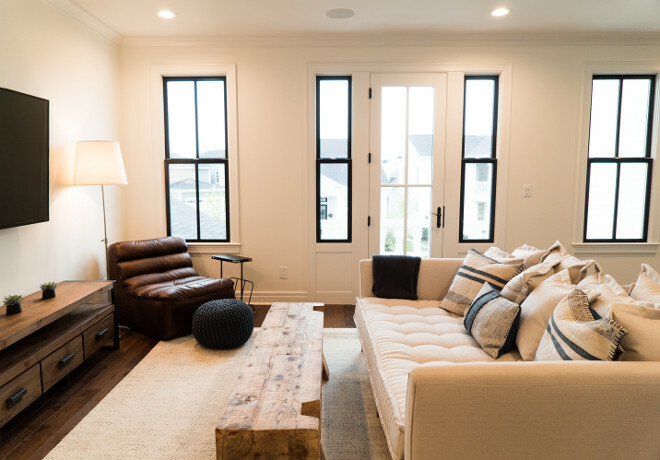 The outdoor rooms are a focal point throughout the house: the second floor has sweeping views from the front deck and side balcony while the first floor has multiple access points to the streetscape via the living room, dining room and owner’s suite. 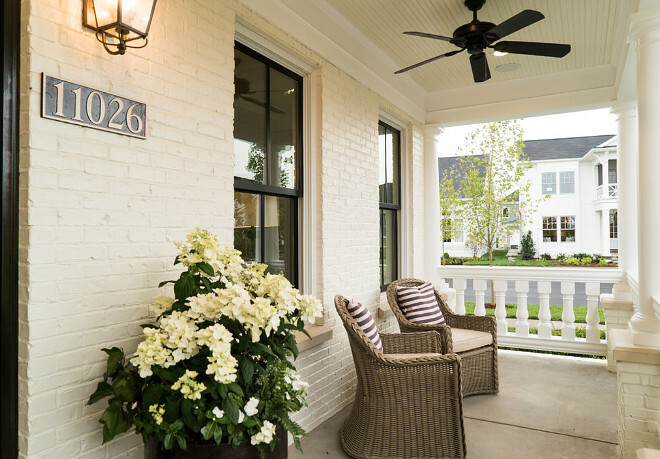 The exterior of this stunning home features brick, painted in a creamy white paint color; Swiss Coffee OC-45 by Benjamin Moore. 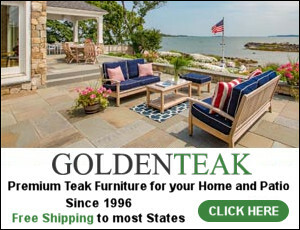 Outdoor furniture is Summer Classics. The living room feels neutral and quite. 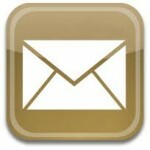 The wall paint color is Benjamin Moore OC-­57 White Heron. Furniture: Sofas, end tables & floor lamp: Four Hands. Coffee Table & Pillows: Classic Home. Table Top Accessories & Arrangement: Pottery Barn. 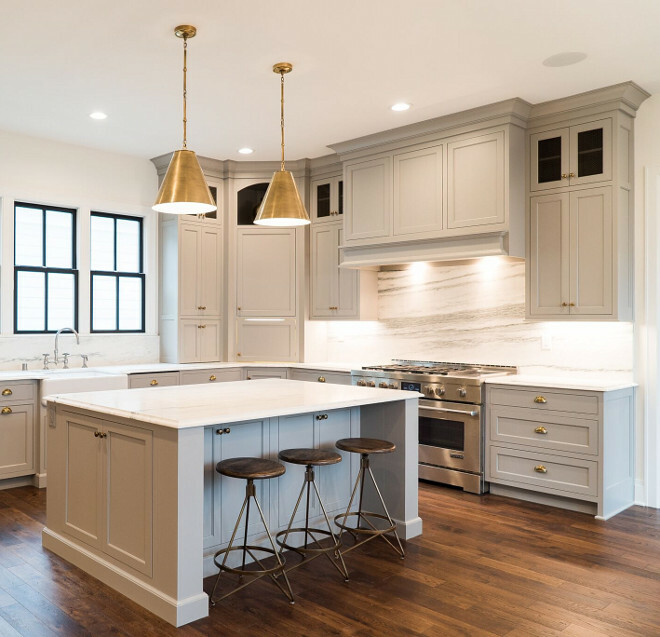 Grey Kitchen Paint Color: Benjamin Moore 1474 Cape May Cobblestone Grey. The wall paint color is Benjamin Moore OC-­57 White Heron. 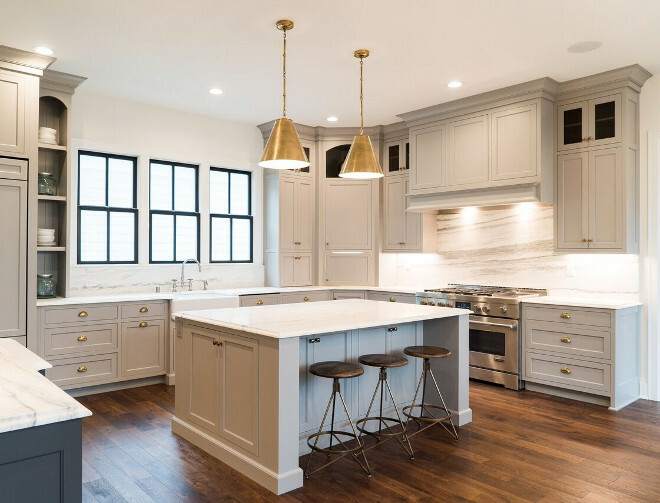 Cabinets are Maple with Inset doors and brass hardware. Cabinet hardware is Amerock Hardware. 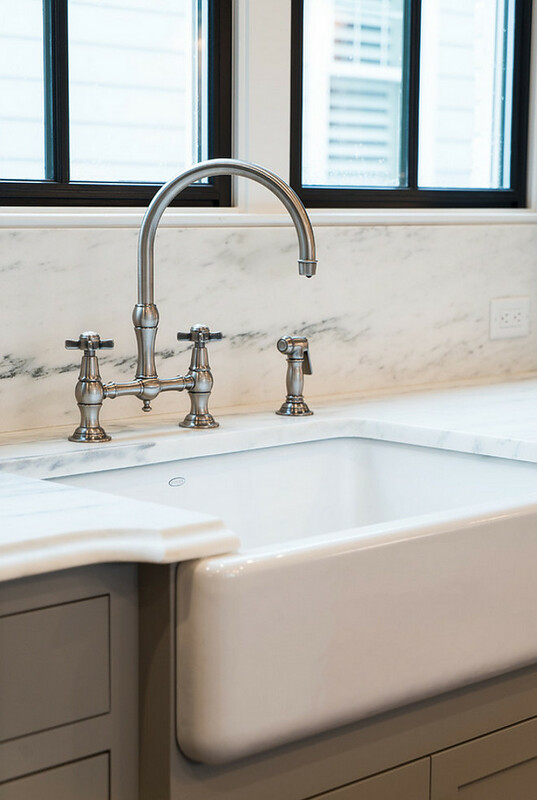 Faucet is Newport Brass and the farmhouse sink is by Kohler. Countertop and backsplash is Arabescato Danby Marble Honed. 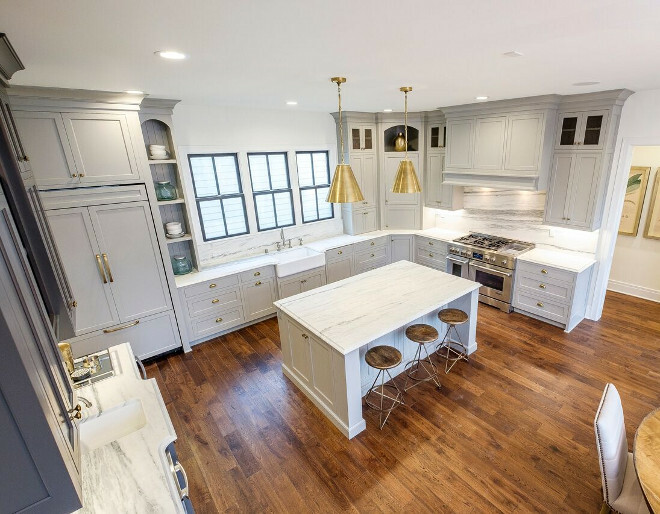 Featuring a smart layout, this kitchen offers plenty of storage and workspace. Hardwood Floors: Bella Cera -­ San Pietro. Color:­ Trento. 5” wide and 3/4” thick, White Oak. Blue Gray Cabinet Paint Color: Benjamin Moore 2134-30 Iron Mountain. Backsplash is from Ann Sacks. 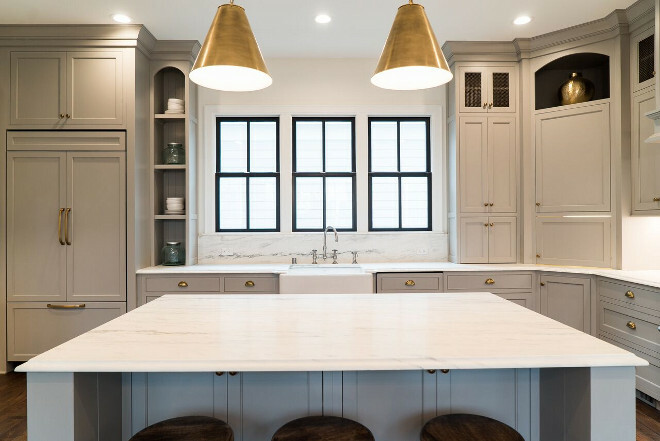 The breakfast room features custom bench and black steel bow windows. Paint color is Benjamin Moore HC-­163 Duxbury Gray. Furniture: Desk, Chair: Four Hands. The industrial lighting is from Elk Lighting. 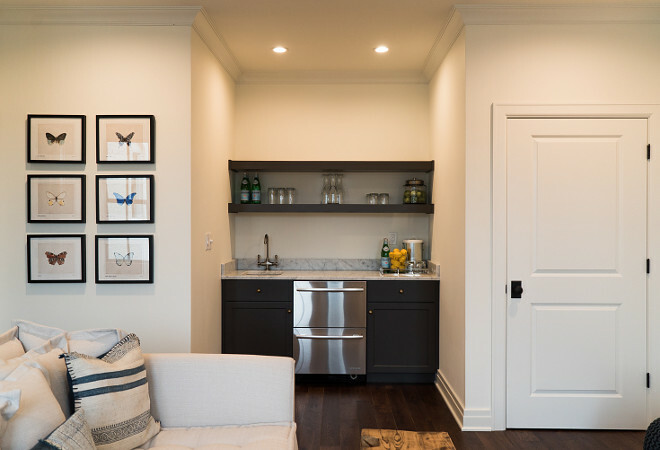 The mudroom features practical grey cabinetry and hardwood flooring. Wall color is Benjamin Moore OC-57 White Heron and the built ins are HC-163 Duxbury Gray. Isn’t this bedroom inviting? 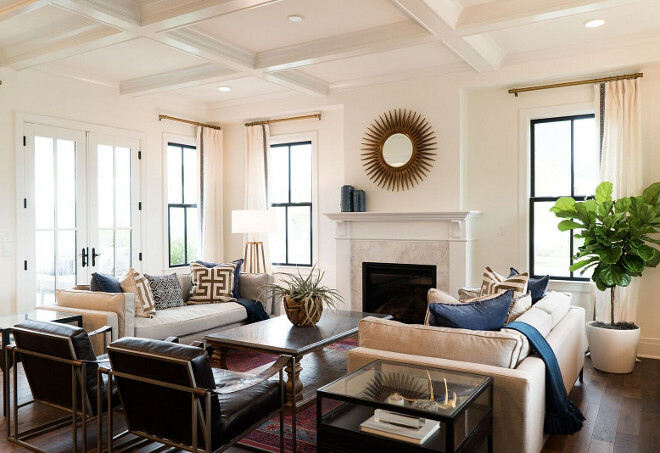 This neutral paint color works perfectly with the decor. 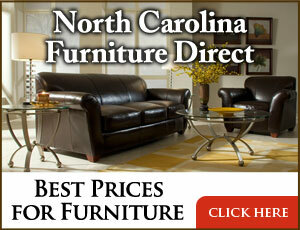 Furniture: Bed, Nightstands, Dressers & Side Tables: Four Hands. 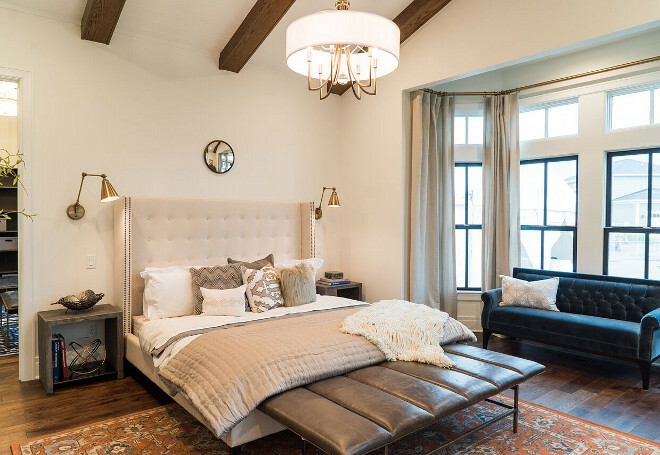 Mirror above Bed: Pottery Barn. Paint color is Benjamin Moore White Heron. 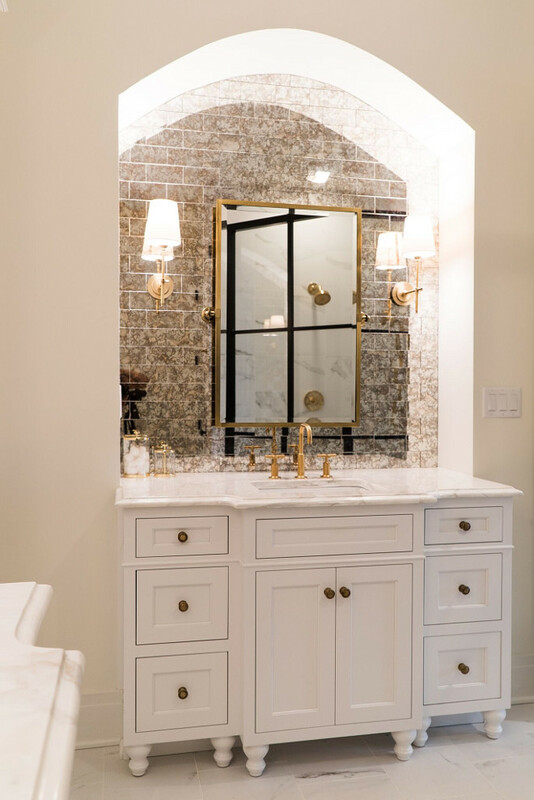 The master bathroom mixes different elements in a glamorous way. 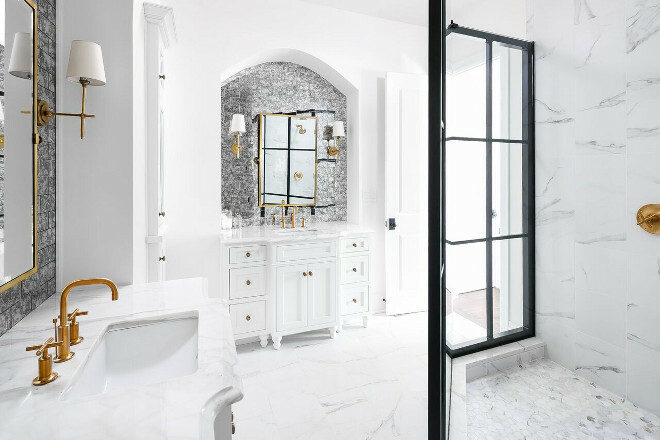 It features white marble, antique mirror subway tile backsplash, brass fixtures and black famed shower doors. 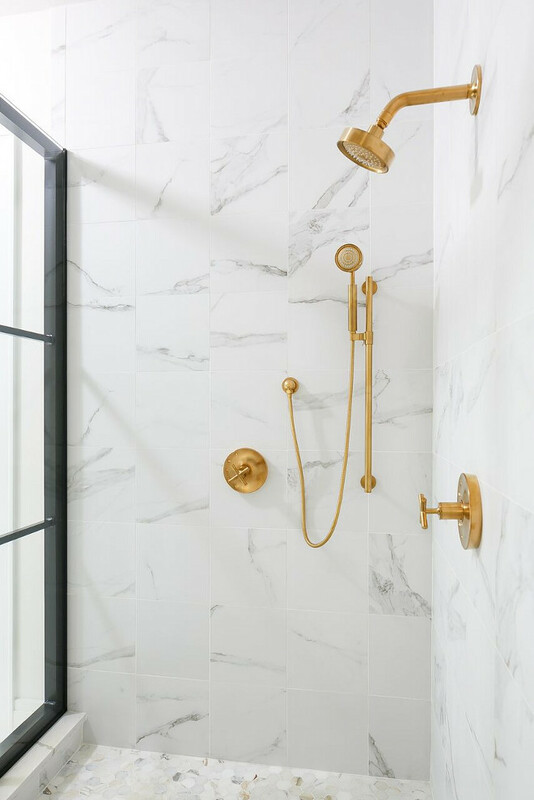 The shower combines brass shower fixtures with the Carrara marble tile and a black shower frame. Flooring is marble hex tile. 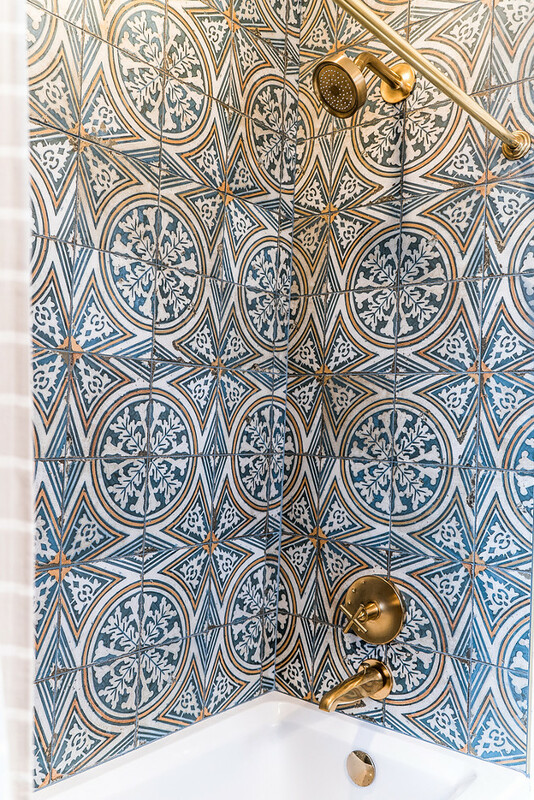 Bathroom Tile: Anatolia Tile + Stone. 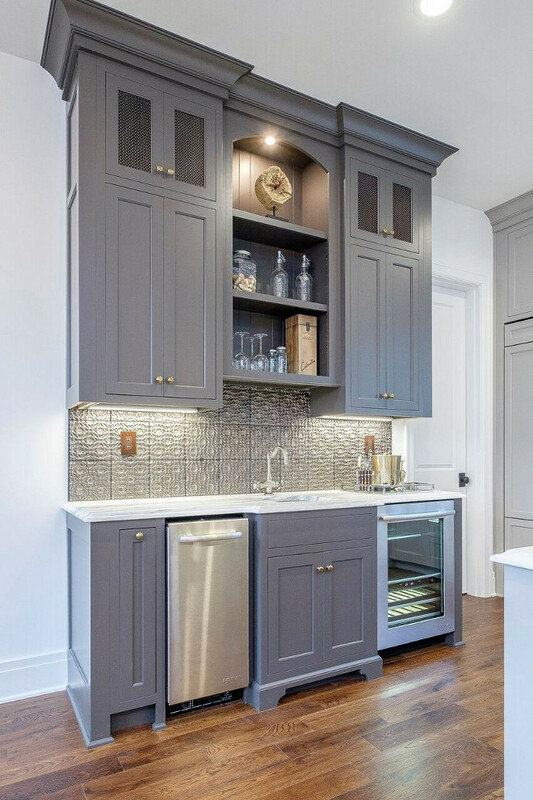 This cabinet is tucked onto an arched niche with antique mirror backsplash tile. 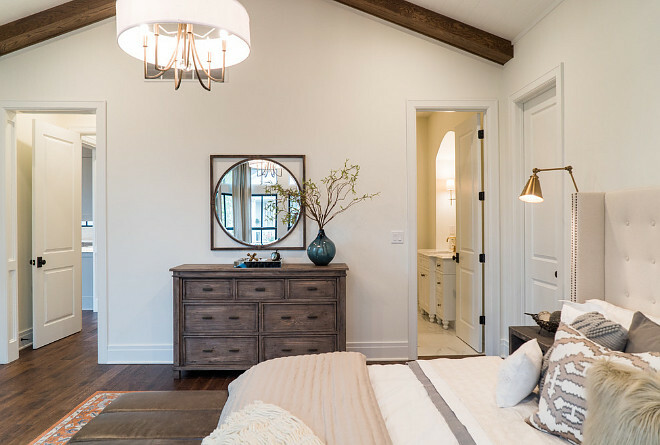 Sconces are from Visual Comfort. Bathroom faucet is by Kohler. 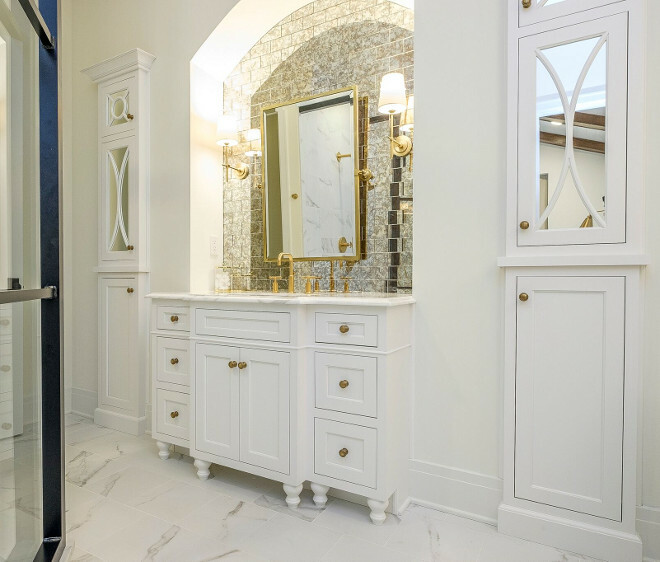 The other side of the bathroom features another cabinet tucked onto an arched niche anchored by two cabinet towers with mirrored doors. 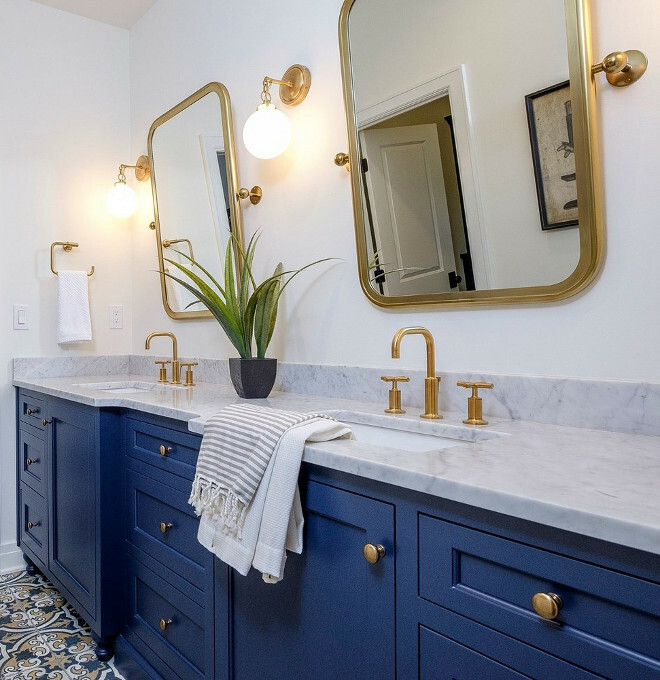 The brass mirrors are from Pottery Barn. 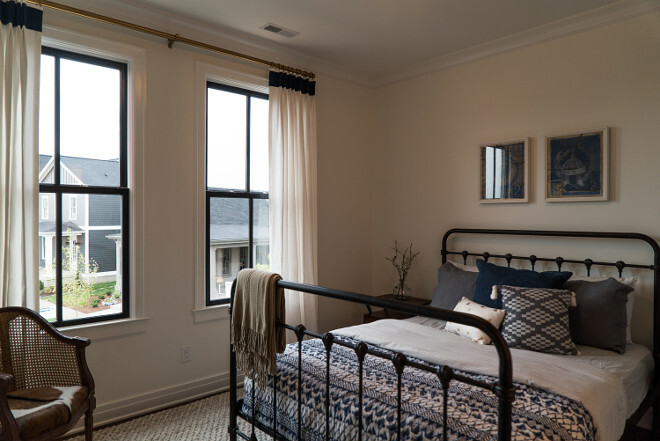 Lovely modern farmhouse bedroom with navy accents. The metal bed is by Four Hands. 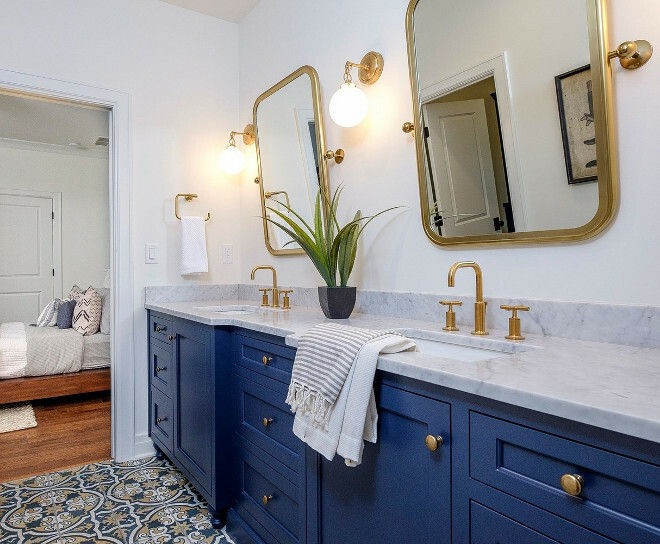 I am loving everything about this bathroom, from the blue vanity to that stunning blue cement tile! The floor tile is Royalty Canarsie 17.75″ x 17.75″ Ceramic Field Tile in Blue/White/Yellow from All Modern. Blue Cabinet Paint Color: Benjamin Moore 2062-20 Gentleman’s Gray. Cement tile is All Modern Royalty 17.75″ x 17.75″ Ceramic Field Tile in Blue/White/Yellow – Gorgeous!!! The upper family room is perfect to relax, watch movies or leave the kids to play their video games. This wet bar is such a great idea! The bar cabinet pint color is Benjamin Moore 2134 -30 Iron Mountain. 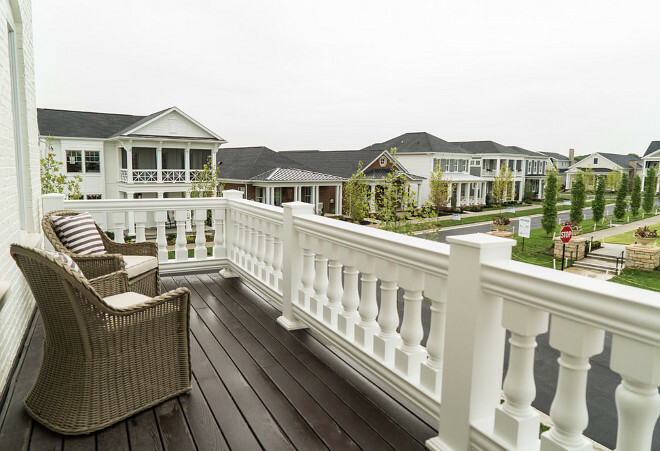 The second floor features a balcony with traditional Italian railing. Isn’t this home stunning? I love the architectural details and the black windows by Windsor. Exterior lighting is by Minka. Monday: Traditional Home with White and Soft Grey Interiors. I’ll be busy this morning… there’s so much to be done this week! You guys won’t believe it… but I will get there… one step-at-a-time, right? We’ll talk again tomorrow, my wonderful friends!